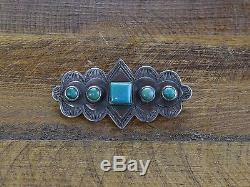 Beautiful vintage sterling silver pin with 5 gorgeous turquoise stones in a symmetrical pattern made by Don Lucas. 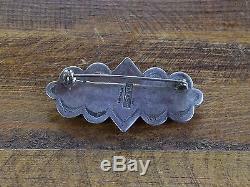 The pin measures about 2" wide and 1" tall. This piece is hallmarked "D Lucas Sterling". Feel free to ask any questions and thank you for looking! The item "Vintage Turquoise Sterling Silver Pin by Don Lucas" is in sale since Thursday, January 19, 2017.